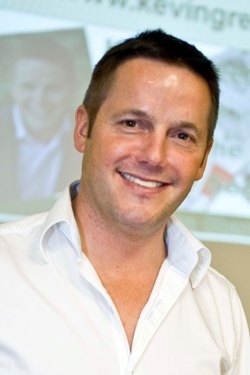 Kevin is Wales' most successful residential landlord. When you meet him and hear his fascinating story, not only will you be bowled over by his knowledge and enthusiasm for life and the property industry but you will find his 'rags to riches' story rather larger than life. Kevin, a property guru, social entrepreneur and trainer is the proud owner of 267 properties throughout Wales, worth in excess of £29 million. Kevin built up the family business from 40 dairy cows to 400 during a long process of renewal and grief after the tragic loss of his sister Julie to Lupus at the tender age of 20. The loss of his sister, with whom he shares his birthday date, left Kevin with a big hole in his heart. Julie's memory is and will always be the main driving force in Kevin's life. Since Julie's death, Kevin has vowed never to waste one minute of this precious life that is bestowed upon us. Kevin's quest for knowledge began when he was embarked on the course 'Mindset for Success' - studying the attitudes and personalities of high achievers. He had always been fascinated by the mindset of successful people. He embarked on a worldwide trip interviewing top entrepreneurs around the globe from Bill Gates to Richard Branson. Kevin secured time with each and every one of some of the world's best known international success stories. One of the themes that stood out to Kevin more than any other was that some of the most successful people in the world will often make decisions more from the heart than from the head – surprising you might say although this will prove relevant later on in Kevin's story. Kevin, tells how, inspired by the success stories, he had heard, made his fortune in property.